The ZX Printer, launched in November 1981 at a price of £49.95, was Sinclair's typically non-standard answer to the prayers of ZX81 (and, later, Spectrum) owners who wanted a printer for their computer. In those days, a good-quality printer could cost upwards of £250 or more - in the ZX81's case, this would have been several times the cost of the computer itself. Although it was possible to connect a parallel-port ("Centronics") printer to the ZX81 or Spectrum via third-party interfaces or Sinclair's own Interface 1, in the case of the Spectrum, there was clearly a market for a budget alternative. 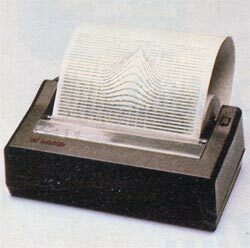 The ZX Printer fit this niche well; it was a popular product and sold tens of thousands of units. 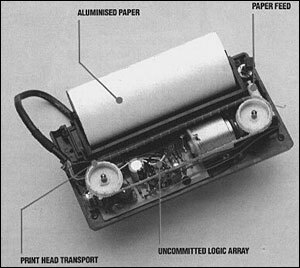 The design of the ZX Printer was heavily influenced by similar devices available at the time in the United States. It was never intended for word processing purposes, instead being aimed at users who wanted to obtain program listings for reference purposes. The printer used black paper coated with aluminium and printed 32 characters to a line. Two styli were mounted on a belt which moved across the paper. An electric charge was passed through the styli, burning away the aluminium coating to reveal the black paper underneath in the shape of the appropriate character. This ingenious approach gave clear if slightly ragged results, but unfortunately the machine itself was not very robust - the print quality rapidly deteriorated with use. For that reason there are not many well-functioning ZX Printer still around today. The electrostatic paper itself is also problematic in use. These days it is difficult to find suitable paper, and even back in the early 1981 the limitations of the paper were very apparent. The aluminium surface is very delicate and skin oils rapidly degrade it, making it very easy to leave fingerprints all over a pristine printout. It also fades over time. The solution, surprisingly, was to photocopy it. This was how the program listings which were a standard feature of Sinclair magazines were produced - via photocopies of ZX printer output. A rebadged version of the ZX Printer was available from Timex in the United States as the TS 2040.